A few weeks ago my Waze Navigation app determined the fastest way to get back down to Orange County from Downtown LA was drive across 6th Street, from west of the 10 Freeway, due southeast to the Santa Ana Freeway. It’s only about four miles. But in late afternoon traffic, I crept along at sub-teen speeds. So there was plenty of time to see the homeless encampments on either side of the street for nearly the entire four miles – and I was just on one street. This past Saturday, the Los Angeles Times published an Op-Ed piece entitled Psychiatric patients need hospital beds, not jail cells, recalling that LA County leaders often call their jail system “the nation’s largest mental hospital.” Unfortunately, in LA, jail is frequently where people who really need to be in psychiatric hospitals, community-based rehabilitation programs, or supportive housing are warehoused – until they’re released back to the street. Then, it’s just a matter of time until another mental health crisis leads them to a confrontation – or they’re judged to be of harm to themselves or others, and returned to jail, often with a pit stop at a local hospital in between. It’s estimated that one in three of LA County jail’s inmates are diagnosed with mental health disorders (roughly the same percentage that’s on the street). That means over 5,000 psych patients are incarcerated in LA County jail alone. And once in jail, if a mentally ill person acts out, their overseers respond with force and isolation, rather than “care-oriented responses geared toward improving behavior and encouraging recovery or at least better management of symptoms,” according to the Op-Ed piece. Beginning with Los Angeles City-sanctioned and encouraged gentrification – typified by The Medici Apartments, “the premier resort apartment community in new Downtown Los Angeles” – Downtown LA has replaced roughly 10,000 Single Room Occupancy residences that truly were “affordable” housing with those that clearly aren’t. According to the LA Homeless Services Authority, LA County’s homeless population increased 42% to over 55,000 between 2010 and 2017, with a slight decline in 2018, as median rent in the county increased by 32% and renters’ median income declined by 3%. Most important, of LA’s homeless, 75% are considered unsheltered, meaning they’re living in cars, tents, and out in the open. In comparison, New York City has about 77,000 homeless, but only 5% are “unsheltered.” Why? Because New York’s courts have required that the city provide shelter beds for all. Although mental illness is a huge issue in LA, only 27% of people who are homeless on any given night have a serious mental illness and 15% have a substance use disorder, compared to San Francisco, where 41% of homeless people report a substance use disorder and 39% report a mental health condition, according to LAist. Even with the other issues that can factor into homelessness – mental illness, substance use, domestic violence, exiting foster care, lack of family ties and support network – poverty is the overwhelming factor. When you factor in cost-of-living, California has the highest poverty rate in the nation and Los Angeles County has the highest poverty rate in the state, according to KPCC news. 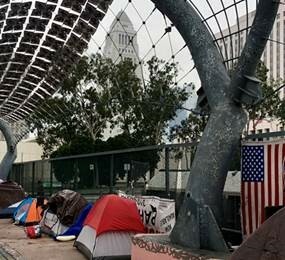 As the proponents of Proposition 2 (the “Use Millionaire’s Tax Revenue for Homelessness Prevention Housing Bonds Measure”) stated: “Of the roughly 134,000 homeless people on the streets of California, about a third are seriously mentally ill. Their illnesses cannot be successfully treated on sidewalks. They must get housing first.That’s why the state of California wisely enacted Assembly Bill 1816 two years ago to raise $2 billion to build or preserve permanent supportive housing for homeless people suffering from mental illness. And last November Prop 2 passed with 61.1% of the vote. Yet it’sestimated that 568,000 affordable housing units are still needed for the lowest-income renters.